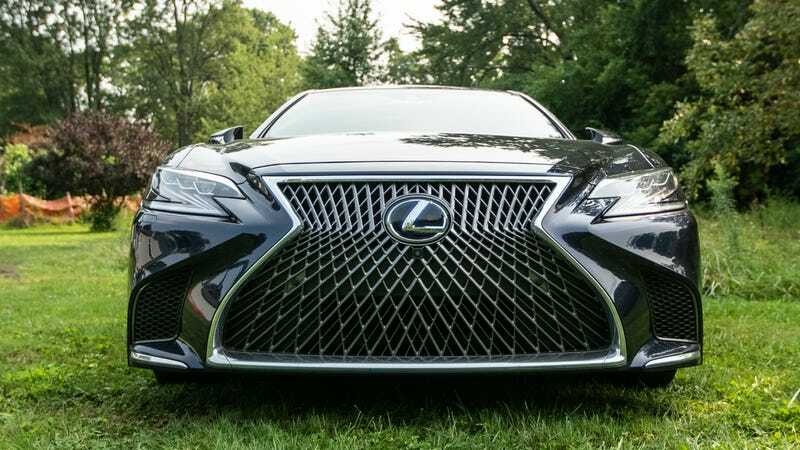 The 2018 Lexus LS500 is already a luxurious car. It’s got leather everywhere you look, and it’s loaded with the latest technology. With no options whatsoever, the car already costs $75,200. But if you really want to go all-out, it has one single option box you can tick off that costs an astounding $23,000. Twenty-three thousand dollars. To put that in perspective, you can walk into a Toyota dealership right now, and pay $23,845 for a new Toyota Camry. You’ll pay less if the dealership gives you a deal on it, which I don’t see why they wouldn’t. That little screen, my friends, is the key to the kingdom. From that little screen you can not only recline both seats, the back right seat unfolds into an ottoman-adorned recliner, pushing the front passenger seat out of the way as it does so, because only peasants sit in the front. Both rear seats benefit from extensive shiatsu massage programs, complete with a “spot heater” that applies heat in just the small spot where you are currently feeling massage pressure, as as to better replicate the feel of a human hand gently pushing against your backside. Because you paid $23,000 for it, damn it. You need the feeling of a human hand, especially considering as the level of wealth you need to accrue simply to be able to afford such an option necessitates, fundamentally, a distance from other “humans.” Might as well simulate it then. Of course, a screen would be a bit silly if all you used it for was extremely precise control of the backrest, seat bottom, head rest, seat heating, seat cooling, lumbar support, level of cushioning, massage, spot heater, ottoman, and all 22 ways the rear seats could possibly move. What a terrible waste that would be, of course. So you can also control all of the audio for the rest of the car, the privacy shades that emerge from the bottoms of the rear doors and the rear windshield, and the interior lighting. All that is great. Really, it is. If you can’t find a way to get comfortable with 22 ways of power adjustment, privacy shades, an ottoman, and the simulated touch of a human hand, that’s your problem. But it’s not a $23,000 problem. Plenty of luxury car companies offer a similar sort of “executive seating” package, from Cadillac to Mercedes to Rolls-Royce. But those other companies don’t have hand-folded origami cloth. They don’t have hand-cut Kiriko (yes, KIRIKO) glass. Okay, okay, I know I keep saying those words, and no one has any idea what they mean. So let’s start with the cloth, and then we’ll get to the glass. Lexus, conceivably, could have done what every other automakers does. They could’ve slap some machine-stitched nice leather inside and call it a day. If they really wanted to go all out, they could’ve put on some carbon fiber or something. Also made by a machine. But that is not the $23,000 Executive Seating Package with Kiriko Glass way. Because the reason it’s at such a sky-high price is because it’s done by hand. The old fashioned way. Starting with one big piece of cloth, a Lexus “Takumi” master craftsman meticulously hand-folds each pleat in the cloth, segment by segment by segment. The end result is a complex diamond pattern that does indeed look funky and cool, and feels incredibly soft to the touch. Lexus claims it took them four YEARS of trial and error just to get the process down right. Presumably someone else was designing the rest of the car while they were doing that. And then there’s the glass. “Kiriko” refers to a Japanese method of cutting colors into clear glass. In this case, because it’s the $23,000 Executive Seating Package with Kiriko Glass, Lexus does it by hand. Each piece of glass is meticulously cut by big machines using the guiding hands of even more skilled master craftsman, who etch the lines into the glass just so. The end result of the etched glass, naturally, is that it kind of makes the interior looks like it’s got design accents from a 1950s American diner. But that’s not the point now, is it? The point is that you can have a car with all sorts of little hand-finished details. And sure, you can get that sort of thing in a Rolls-Royce or a Bentley, and it’s not a problem at all. But a Rolls-Royce or a Bentley can go for upwards of $300,000, easily. Which means at $23,000, this option package might just be a steal.